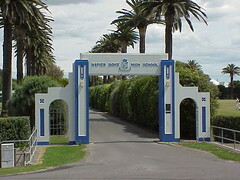 The Napier Boys' High School website is tantalising when it states 'Originally built in brick in 1926, the school has now been fully redeveloped in the Deco style, in keeping with the Napier City theme' but gives no further details relating to the architect or the dates o the remodelling. In any case, we can get a taste of the style from this view of the entrance gates to the school and the driveway lined with palm trees behind and only imagine the deco splendor enjoyed by the schoolboys while they study. 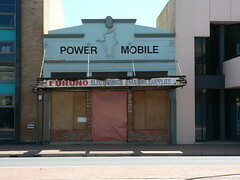 I caught this small shop in St Vincent Street, Port Adelaide in mid-change from a Marine Electronics shop to a Mobile Phone shop in September 2005. I like the disaster area below the verandah and the beautiul signage above it. I also like that the shop front is made of wood. Most of the time Art Deco elements are made from concrete but this little shops nods to the Australian past of wooden buildings. So traditional building technoques are employed even though the original shop owners want to show they are part o the modern world. I'd like to see what has become of this little place in the last 3 years since I saw it in this state. 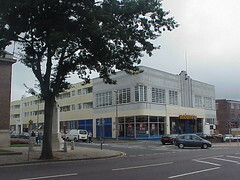 On a visit to West London in 2003 to see the Gillette Factory, I came to Brentford's Golden Mile, a section of the Great West Road opened in the mid 1920s and quickly became a preferred location for new factories, many Art Deco in style. We pulled he car off the road so I could jump out and take some photos. The gate above is the first thing I saw. Obviously it was deco but I had no idea exactly what I had come across. 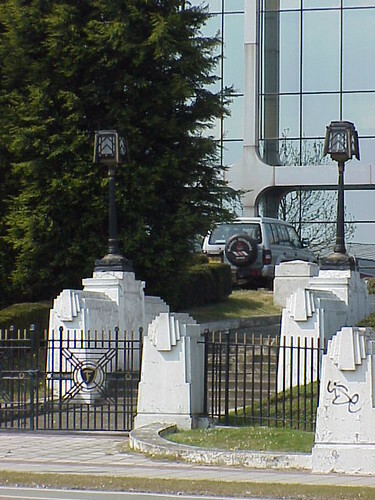 The fence along the main road was interspersed every few metres with these stylish pillars. It was not until I reached the main gates that I was able to confirm what I was beginning to suspect. The F on the gates told me this was all that was left of the Firestone Factory. Designed by Wallis, Gilbert & Partners in 1928, The Firestone Factory was an Art Deco gem, not unlike the Hoover Factory in Perivale also by Wallis, Gilbert & Partners. I've read conflicting reports on various websites that the factory was demolished in 1971 or over the August Bank Holiday weekend in 1980 just days before a Preservation Order was going to be enacted. 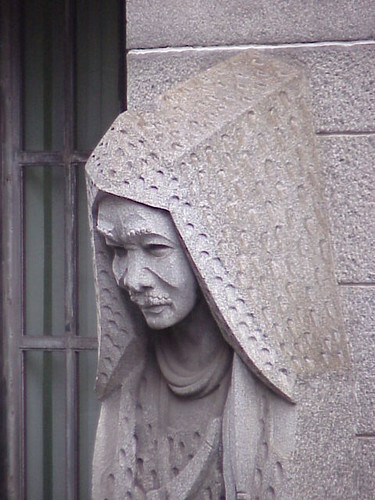 Certainly the Twentieth Century Society website supports the second version. Gavin Stamp and Alan Powers go on to say that the demolition served as a catalyst to protect 20th C buildings leading directly to the listing of 150 inter-war buildings. 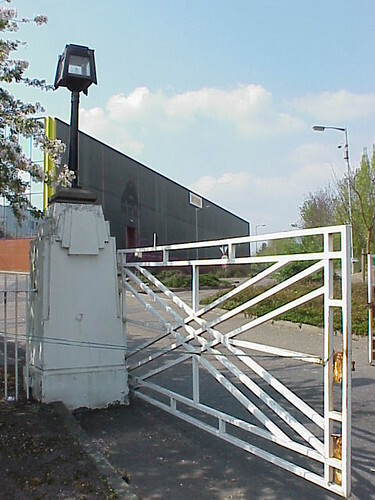 The fence and gates are now Grade II Listed which I guess is something and it does serve as a reminder of one of the greatest acts of architectural vandalism. There are lot more pictures on the delightful Dog and Deco site and if you can face seeing what the building looked like before and as it was being demolished then have a look at www.users.globalnet.co.uk/~garycr/2001/firestone_factory. 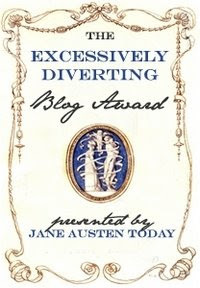 The aim of the Excessively Diverting Blog Award is to acknowledge writing excellence in the spirit of Jane Austen’s genius in amusing and delighting readers with her irony, humour, wit, and talent for keen observation. Recipients will uphold the highest standards in the art of the sparkling banter, witty repartee, and gentle reprove. This award was created by the blogging team of Jane Austen Today to acknowledge superior writing over the Internet and promote Jane Austen’s brilliance. Today I was nominated to receive an Excessively Diverting Blog Award by Hels at ART and ARCHITECTURE, mainly. Thanks Helen, I've found your posts entertaining and informative. 1) In Lost City, Brooks of Sheffield documents the remnants of old New York that are disappearing under the never-ending rush of progress or hang on through good luck or good judgement despite the odds. 2) Richard Nickel jr subtitles the The Kingston Lounge as Guerrilla preservation and urban archaeology. Brooklyn and beyond. He shows once wonderful buildings that are under threat of demolition or suffering demolition by neglect ie left to rot. 3) The Mindful Walker, Susan DeMark, urges us to take our time and explore and enjoy the buildings and streets of our neighbourhoods in this fabulous blog. Susan concentrates on New York City but also looks at the hudson Valley and places further afield. 4) Mo has been bringing Fresh eyes on London since mid 2007 showing London from the point of view of someone new to the city. 5) In a similar way to Lost City, Adam writes about the parts of Paris that others ignore in Invisible Paris. 6) I love the name and I love the attitude. In sit down man, you're a bloody tragedy, Owen Hatherley has an opinion on many things and he is not afraid to let you know where he stands. I await his reaction to this nomination with some dread. 7) My final nomination is Chris Boyd's The Morning After: Performing Arts in Australia. Chris brings his personal, yet professional reviews, of drama, dance, opera and music from around Australia all with a wicked sense of humour. Another reaction to this nomination that I approach with some dread. Thanks to all my nominations. I have enjoyed reading your work and thansk again to Helen for nominating me in the first place. 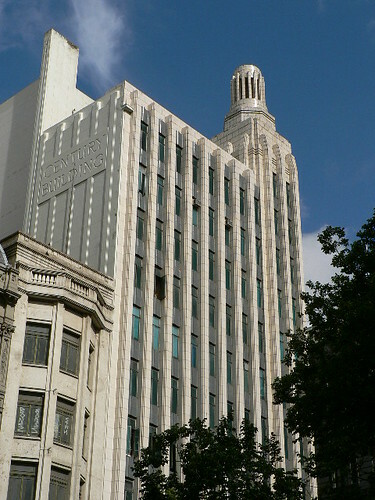 The Mutual Building, the former headquarters of the Old Mutual company in Cape Town, is a huge skyscraper in downtown Cape Town. 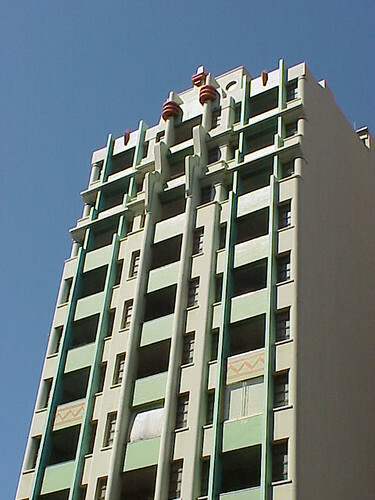 Dating from 1939, it was designed by F M Glennie and Louw & Louw. 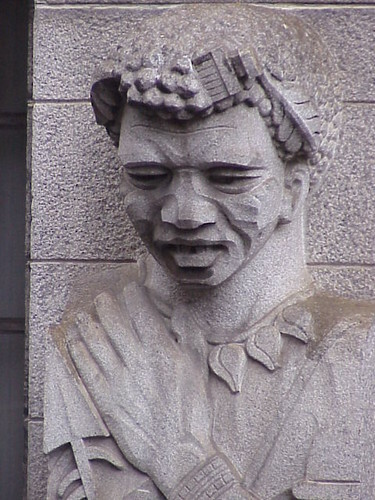 The building features many decorative features including elephants and baboons heads on the upper levels and an amazing frieze around the whole building just above street level showing the history of the colonisation of South Africa. The interior is also richly decorated. 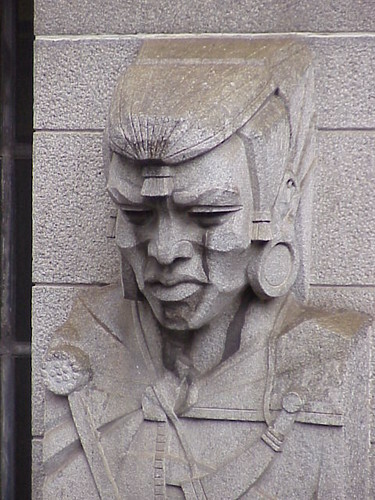 Today though, I want to concentrate on the series of nine reliefs on the side of the building depicting the black tribal groups of southern Africa. 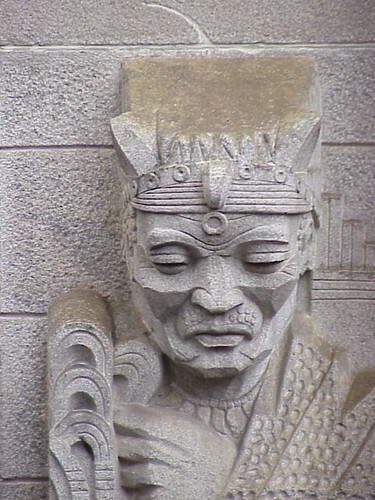 The carvings are exquisite and have been executed in great detail. Each one is named although several are somewhat out of date. 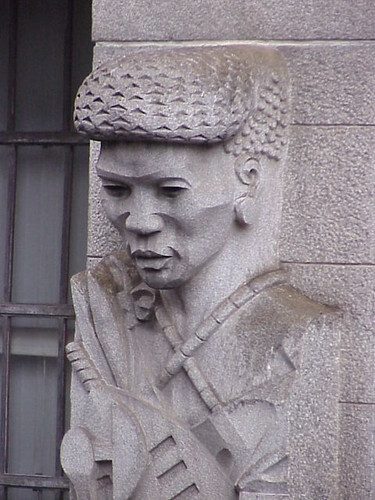 If you want to know more about the peoples of southern Africa, particularily the black tribal groups, the South African Tourism website has an excellent write-up. 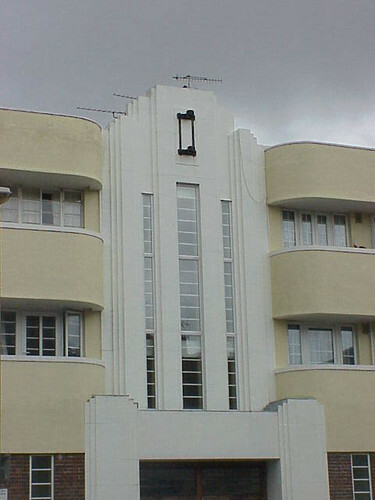 This wonderful streamline Art Deco entrance belongs to a large block of flats in Worthing, in the south of England. No doubt it once had a flagpole as can be seen in the entrance to the commercial part of the building around the corner. I don't know what business originally occupied that part of the building but as you can see back in 2000 it was a Blockbuster Video store and as far as I know it still is. The raw concrete and upper floors of the flats have been painted white since I was there as can be seen in Alan Cooper's 2006 photo on http://www.geograph.org.uk. There would be a nice sense of irony if this had once been a cinema, now a Blockbuster Entertainment store but it looks more like a showroom with lots of glass on both floors. 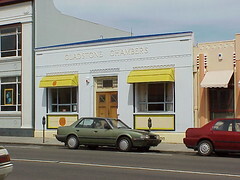 The Gladstone Chambers in Tennyson Street, Napier is a simple single storey building like many constructed immediately following the 1931 earthquake. The Art Deco Inventory compiled by the Art Deco Trust and Napier City Council lists Finch & Westerholm as the architects with construction being completed in 1932. 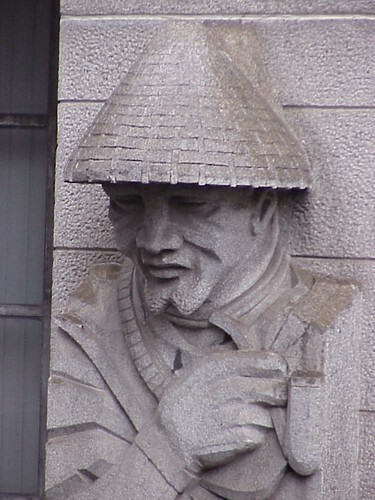 Gladstone Chambers has very little decoration along the roofline, normally a mainstay of Art Deco buildings. The lettering in the name, set on the facade, is very simple with a decorative row of semi-circles interspersed with pendant shapes. Above the doorway and each of the two windows there is a more complex design consisting of rounded shapes layered with two sizes of triangles. 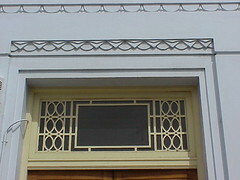 The building also features a decorative grill on the window above the door. Yet another arrangement of geometric shapes provide the decoration in the recessed rectangular panels under the windows. At the very base of the building the vents at footpath level are very stylish and as can be see in the photo below are placed below the windows according to the deco rule of three. 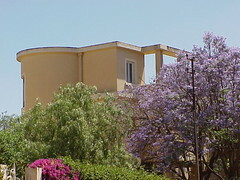 A glimpse of the Avram Villa in Asmara well hidden behind the purple flowers of the Bougainvillea grwoing over the walls of the property. According to the Lonely Planet Ethiopia, Eritrea & Djibouti guidebook, Avram Villa was built for the L'Atilla family in the 1930s. LP also refer to the unusual 'surfboard' loggia on the rooftop terrace. This morning to my astonishment I found another Stapley Parade Drinking Fountain. 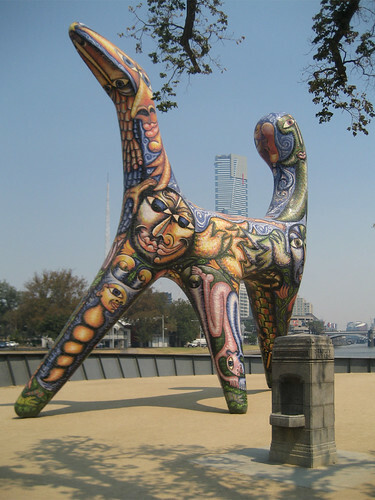 It is identical to the one I wrote about on Monday which is on the Yarra in Birrarung Marr. This one is further along the river near the Morell Bridge. I've been able to find some more details thanks to this website created by the Cultural Heritage Unit at the University of Melbourne. In 1936, the area between the Yarra River and Batman Avenue was named Stapley Parade Reserve, after Councillor Frank Stapley, who represented the Albert Ward from 1898 to 1939 and served as mayor from 1917 to 1918. It goes on to say that two identical fountains were constructed at either end of the reserve and were engraved 'Stapley Ave'. Clearly they are now engraved 'Stapley Parade' but presumably still mark the extent of the Stapley Parade Reserve. I've looked at my 1991 Melways and the reserve is not marked and of course the city end of the reserve and Batman Avenue have now been incorporated into the Birrarung Marr park and the Federation Square development. 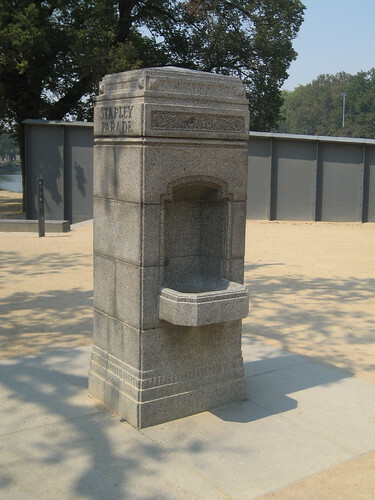 Another page on the website lists other memorial drinking fountains around Melbourne, including some I have previously written about. Often buildings are named after their owners but in the case of the Beaucott Buildings, in the busy Perth suburb of Mount Lawley it is the cross-streets, Beaufort and Walcott, that contribute to the building's name. 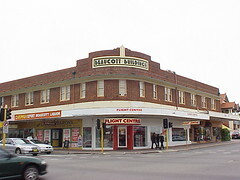 According to the Media Statement issued in May 2001 when the building was placed on the Heritage Register in Western Australian, the original single storey building was built in 1905 and consisted on shops and residences. 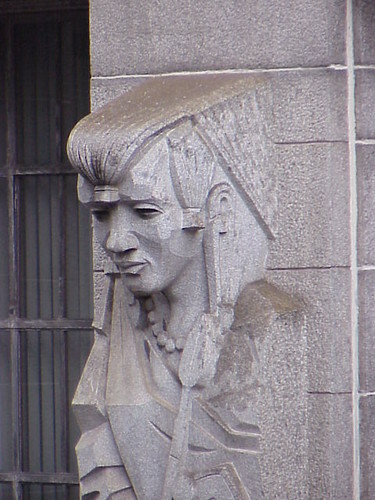 In 1937, architect William G Bennett was engaged to upgrade the building resulting in the Art Deco structure the now dominates the corner. Bennett's design allows the building to wrap around the corner with a main shop doorway at street level and a stepped parapet bearing a small fin. 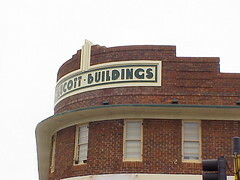 A rendered cream panel bears the building's name in an approriate art deco font. A practical element for Perth's hot summer climate is the eyebrow which runs the entire width of the building providing shade for the row of second storey windows. I must have ridden past this spot in Birrarung Marr on the north bank of the Yarra a hundred times or more and yet this morning I noticed this former drinking fountain for the first time. I've previously written about similar fountains on Brunton Avenue close to the walkway linking Birrarung Marr to Yarra Park and a second Brunton Avenue near Punt Road Oval. There was also one in Hardy Reserve at the back of Melbourne General Cemetery in Carlton and yet another on the other side of Princes Park in Reynolds Reserve off Royal Parade. 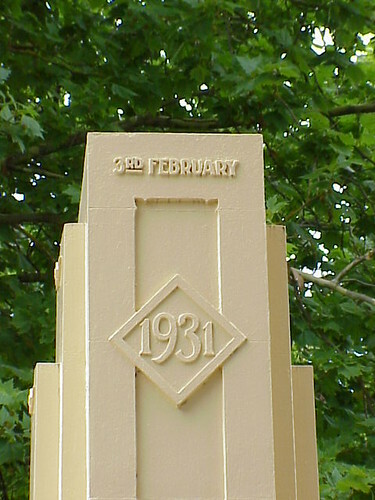 This one is inscribed with the name Stapley Parade and although the overall shape is the same as the Brunton Avenue and Hardy Reserve fountains, the decoration is different, less Art Deco in style. The opening n the body of the fountain, to my eye, is more organic than the other fountains. 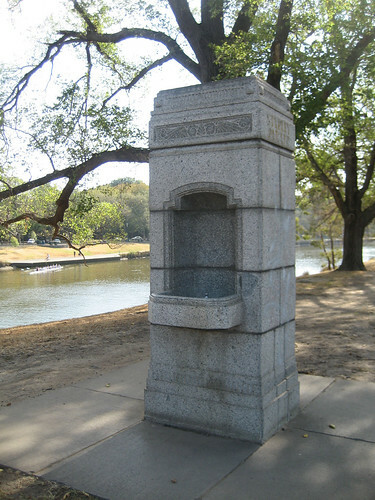 Perhaps dating this fountain to a pre-deco period. 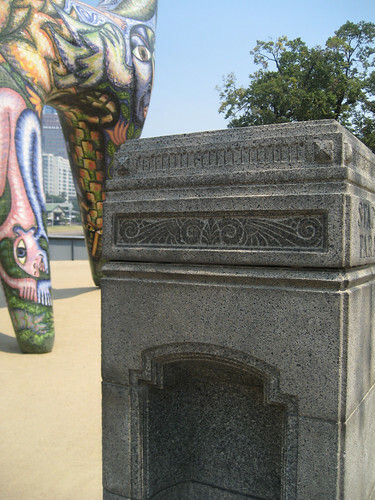 Likewise the decoration on two side of the plinth on top of the fountain does not have the strict geometric shapes of the other fiountains. I wonder how many other of these fountains are out there that I may have passed and not taken in. I've been told there is one in Northcote so perhaps there are others also. Today I went on an Art Deco walk around Port Melbourne led by Robin Grow, President of the Art Deco and Modernism Society. The walk was part of the City of Port Phillip Walk and Talk program for 2009. Perhaps one of the surprising stops on the walk was the Port Melbourne Bowling Club. Although the club was established in the 1880s, it is clear from the photo above that the clubhouse was rebuilt in the 1930s. The columns either side of the doorway use thin bricks to create a visual marker to the entrance as a contrast against the standard sized bricks and rendered walls of the rest of the building. 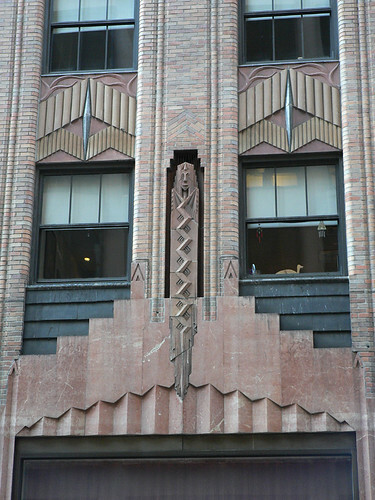 These same bricks are also arranged above the doorway to create a simple art deco pattern. 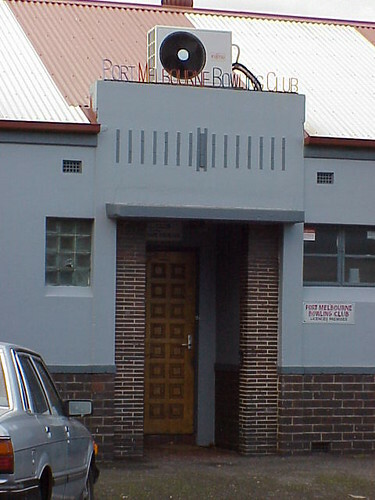 The effect is topped off with metal lettering spelling out Port Melbourne Bowling Club in a suitable font and in the red and blue colours of Port sporting teams. We just have to try to ignore the unfortunate placement of the air-conditioning unit. 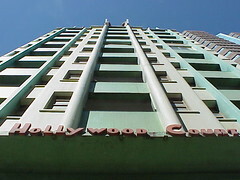 Hollywood Court designed by Hobbs & Bonieux, was constructed from 1937-39 in the South African city of Durban. The vertical columns really stand out on this building and I like the way they undulate on the upper floors perhaps reflecting the seaside location of the city. The main central columns are topped by a series of three discs. While the finial (if that's what it is) right on top is decorated with three rectangles. 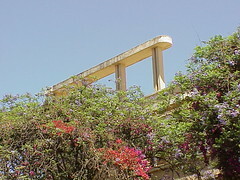 The lines of the building are broken halfway up with a zig-zag motif between the two outer columns. This motif is repeated above the lettering spelling out the Hollywood Court name which sits above the main entrance. 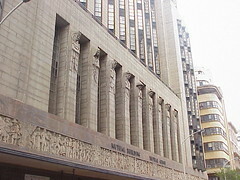 The interior of the foyer retains some original elements include a piece of furniture or decoration which even the Durban Art Deco website has difficulty identifying its function, calling it a folly. 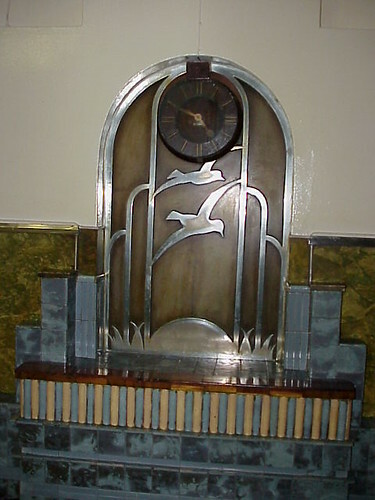 In any case it is a nice piece incorporating chrome seagulls, a clock and tile decoration. Above the railway line near Hawthorn Station there is a much neglected Art Deco billboard. 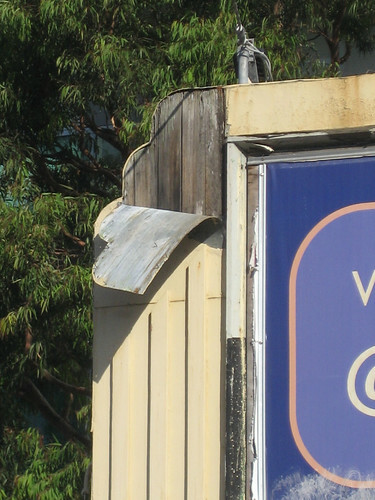 The billboard has a lovely shape with stepping curves on the top corners and a raised section at the centre. Even the bottom corners are stepped but in this case squared off rather than curved. 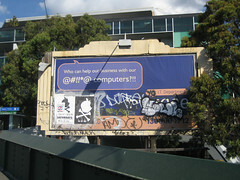 I has been used in recent times but the last ad the billboard sported for a computer company if now obscured by graffiti and hastily pasted posters. The metal sheeting in the is even peeling away from the wood support in the top left corner. It's a shame because with a bit of restoration it could do what every advertiser wants, to stand out and get noticed. 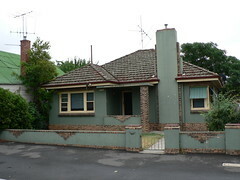 This modest Art Deco home in the rural Victorian city of Bendigo. I particularily like the use of brick as a decorative element against the smooth render of the walls. The simple application of bricks arranged in a triangle is repeated three times along the front wall and also on the wall of the porch at the front door. This porch is supported by a square made from the same bricks. The lowest part of the house is also clad with these bricks and the run up either side of the chimney and break through the roof but do not continue to the full height of the chimney. The bricks have also been used in the shadows at the top of the walls under the eaves. This arrangement can also bee seen in the garden wall which has a row (or two) of bricks top and bottom. The gate posts also have a row of bricks top and bottom with the addition of a stepped element on top. The house certainly isn't as spectacular as this nearby house but I think it is lovely that so much effort was out into the architectural decoration of a modest family home. We had an horrific day in Victoria yesterday (http://www.theage.com.au/national/death-toll-rises-from-bushfires-20090208-80jv.html). Hottest Melbourne day on record, 46.4C, hotter in other places in the State and the worst day of bushfires possibly since 'Black Friday' on 13th January 1939. 100s of houses have been destroyed and 25 people confirmed dead which expectations that the toll will rise. My best wishes go out to all those who have been affected and their families and friends. It got me thinking of positive stories that have come from disasters such as this and then an email arrived in my inbox reminding me of the Geon Art Deco Weekend in Napier. Shortly after a quarter to eleven on the morning of Tuesday 3rd February 1931 a devastating earthquake measuring 7.8 on the Richter Scale hit the North Island of New Zealand about 15 or 20 kilometres north of the city of Napier. Many buildings were destroyed in Napier and the nearby town of Hastings. 258 people died in the two towns and the surrounding district. 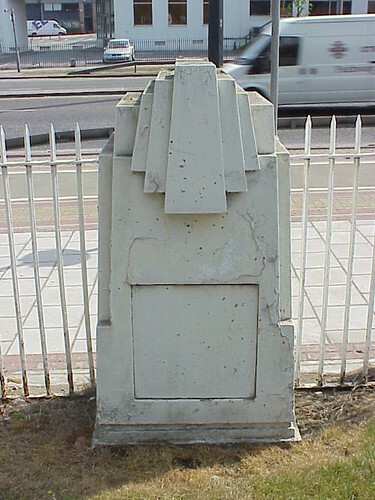 A memorial in Napier honours the memory of those who died. 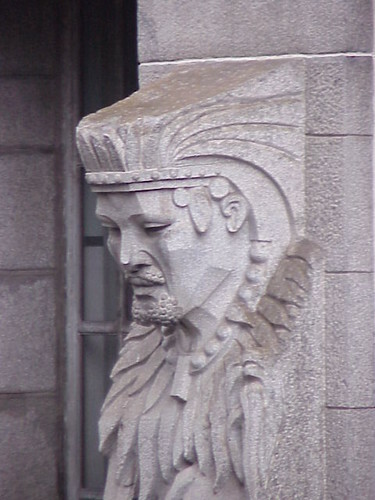 An Earthquake Relief Fund was established by the New Zealand Prime Minister and architects based in Napier such as J A Louis Hay and others from around the country assisted in the rebuilding of the city. By January 1933, the city was able to hold a carnival to celebrate the new Napier. Now, the third weekend of February sees Napier host the annual Art Deco Weekend. This year the events run from Tuesday 17th to Sunday 22nd so obviously they use a different definition of weekend in New Zealand. It is probably more to the point that the Art Deco Weekend has become so popular over its 21 years that they can't fit all the events into a two-day weekend. I suspect it won't be long before it becomes Art Deco Week. As more news comes to hand it is clear that Saturday 7th February 2009 is one of the worst days ever for Victoria. The death toll is horrendous and the number of people who have lot their homes and all their possessions heartbreaking. The towns of Marysville and Kinglake have all but been wiped out. The response from the wider community has been fantastic and I hope something positive will eventually come from this harshest reminder of nature's devastating power. We are custodians of this planet and it will survive in some form for a very long time, but will we. The Red Cross have set up an appeal and are taking donations online through their webite - www.redcross.org.au/. 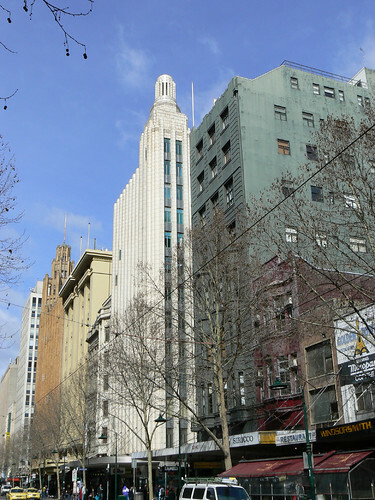 This little section of Swanston Street is very interesting because it shows two buildings by architect Marcus Barlow at either end of the block with Capitol House (1924) by Walter Burley Griffin and Marion Mahoney Griffin sandwiched between them. The brown building in the background is Barlow's Manchester Unity (1932) which echoes the style of the Raymond Hood's Chicago Tribune Building (1922). But the white building in the foreground, Century House (1938-40), also by Marcus Barlow when compared to the Manchester Unity shows how much his thinking changed over the course of 5 or 6 years. While both buildings have similar structure, each with a tower on the corner, the Century Building is much simpler and shining white. 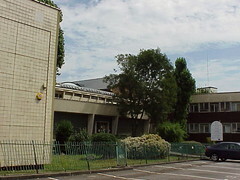 Viewed from the other end of the block, the name can clearly be seen etched into the side of the building. The angle also shows the vertical columns that run the height of the building. In this closer view of the roofline, those columns almost look like a hand grasping the base of the tower. The first building I posted on this blog was the Chrysler Building because it is such an icon of the Art Deco skyscraper. 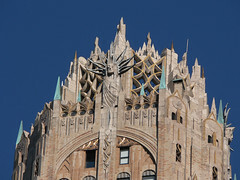 However, that first picture of the Chrysler Building had another fantastic Art Deco building in the foreground. The former RCA Victor Building, now known as the General Electric Building. That is the amazing crown at the top of this page. It has flames, lightning bolts (or radio waves) and stylised faces and is truly amazing. There is also plenty to see from street level. 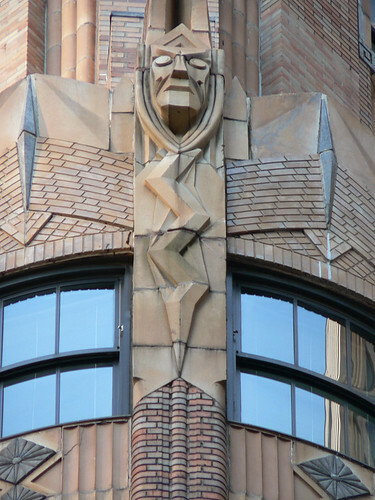 The lightning bolt/radio wave motif is presented on the 1st floor, placed in their own niches between the vertical banks of windows. 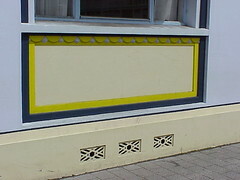 The panels below the windows feature zig-zag decoration and other art deco elements but in the top corners there is more fluid decoration giving an almost Art Nouveau feel. 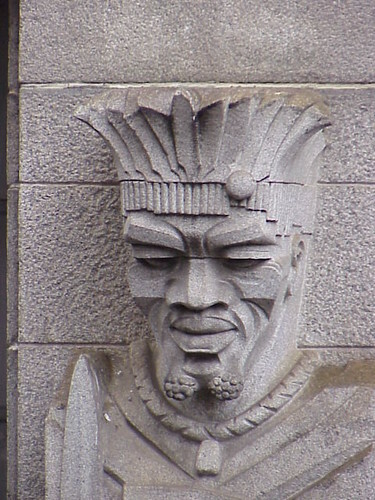 The corner of the building has its own combination of bolt/wave motif and stylised face. This view also shows the decoration in the brickwork. Also on the corner at street level is a clock bearing the GE logo and a pair of disembodied arms holding, perhaps, another variation of the lightning bolt/radio wave. 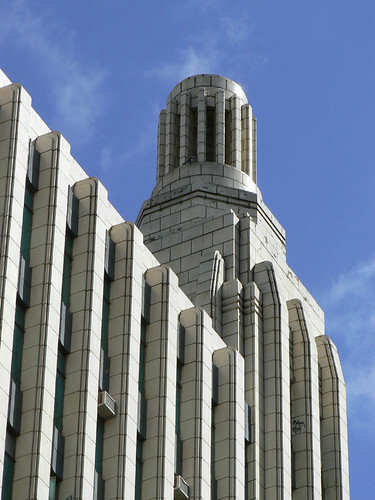 The General Electric Building was designed by John W Cross and dates from 1931. When you go to Miami South Beach, make sure you give yourself enough time to see all the Deco and MiMo (Miami Modern) buildings. Actually, it would take a long time to see them all but you should try to take a guided tour from the Miami Design Preservation League. At the very least you must walk down Ocean Drive both during the day and at night. The hotels and other buildings along the ocean front are fantastic but they take on a different aspect when lit up after sunset. 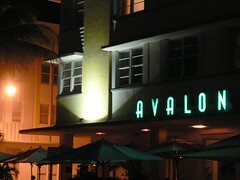 This is a night-time view of the Avalon Hotel. The neon lettering of the name naturally stand out in the dark but also a single white spotlight really highlights the features of the building especially the eyebrows over the windows. 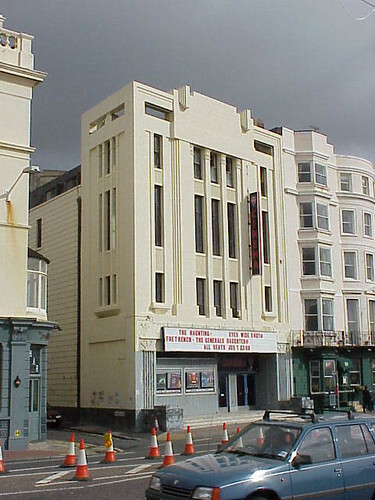 The ABC Cinema (1930) in Brighton was designed by William Glen. 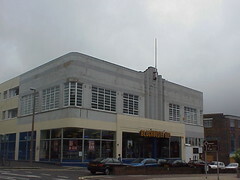 The cinema closed in 1999 and onverted to a casino. This picture was taken around that time. The films showing are The Haunting, Eyes Wide Shut, The Trench and The General's Daughter.